Christaan Felber is a photographer based in New York City. His work spans across multiple genres including commercial, documentary, sports, and music. Christaan has shot for clients such as Rolling Stone, Esquire, and Puma. Your aesthetic is incredibly unique. What are your biggest influences in crafting your images? Thank you! I’ve always been drawn to the side of photography that feels raw and authentic. I think one of my biggest influences in terms of color and texture is the photographer Mark Morrisroe. He used to make black and white duplicate negatives of his color negatives and then sandwich them together when printing, which created this super contrasty, desaturated look. He even used to print using 16mm and Super 8 movie film, which would of course make the prints even grainier. How did you first get into photography? What has the journey been like from the time you picked up a camera to now shooting commercially for clients such as Puma and Apple? I first got into photography after my mom, who was always very encouraging, brought me to the Whitney Gallery in New York when I was around 14. It was a show of photographs by the photographer Kenneth Josephson, and I was impressed by the cleverness of the photos as well as how beautifully crafted the prints were. Luckily, my girlfriend at the time was a member of the school’s photo club and she introduced me to the art of processing and printing negatives. Regarding the journey from being a green amateur to shooting for large clients: Despite the added stress and pressure of shooting for big clients, I think the concept is always the same - it’s really about seeing and capturing the world the way you see and feel it. The hard part for a lot of people is learning to navigate the industry as well as learning things that aren’t taught in art school such as delegating, owning a business, client interactions, industry politics, etc. Those things honestly seem more difficult to me than actually taking the photograph, but I feel I’ve become infinitely more better at all of the above of the years. We absolutely love ‘boxeo classico.’ Can you tell us a bit about how the series came to life and what it was like shooting it? Thank you! It’s one of my favorite series that I’ve done. The way the series came to life was somewhat accidental: I was working in a full-time job after recently graduating from college and was feeling really stuck...just very uninspired. Until one day I was taking the J train from my apartment, at the time in Brooklyn, to my job, in Manhattan. Since the J subway line is elevated through a large portion of Brooklyn, it allowed me to look out over the skyline of the city during my commute. During this ride, I kept passing by the top floor of this building that had its windows covered in old promotional boxing posters. Each day, I would pass this building and wonder what was going on inside. So, I finally walked down the subway platform to the street and went up to the top floor of this building where I found myself in the middle of this beautifully grungy, family-owned boxing gym. The walls were painted bright yellow and the window-light was amazing, so I decided to introduce myself to the trainer/owner and he agreed to let me document the gym and his fighters. After that, I became close with both the owner, Javier, and his stable of young fighters - following them through their training routines up to their matches and competitions. It was incredible seeing the amount of dedication, time and energy they put into the sport. When looking through your images, it is evident that you are very effective at being able to connect with your subjects and bring out a wide range of emotions in them. What is your process like, forming a connection with your subjects, and seeing these emotions come to life in your images? Thank you! That’s certainly part of the challenge when it comes to portraiture is connecting with a subject, and then client-based work takes that a step further where you have to be able to direct the talent in a certain way in order to get specific emotions out of the subjects. For me, it’s about finding a detail about the person you’re photographing and then finding common ground based on that detail. The details could be as simple as the type of shoes someone is wearing, a band t-shirt or a watch. All of these things hint at a personality type and give you a foot in the door to have an open and honest conversation. These conversations build trust and then you can potentially direct the talent (either directly or indirectly) in order to get the feeling you and the client want. Each form of photography also has a different approach. For example, in photojournalism/documentary, the photographer typically wants authentic, unadulterated actions and expressions. In that case, the goal is to become invisible and to let the narrative unfold in front of you naturally. In the case of an advertisement, the client typically has a specific idea as to what they want. My job then becomes to either direct or to manipulate the situation in order to achieve the desired look. What is your favorite image that you have taken and why? 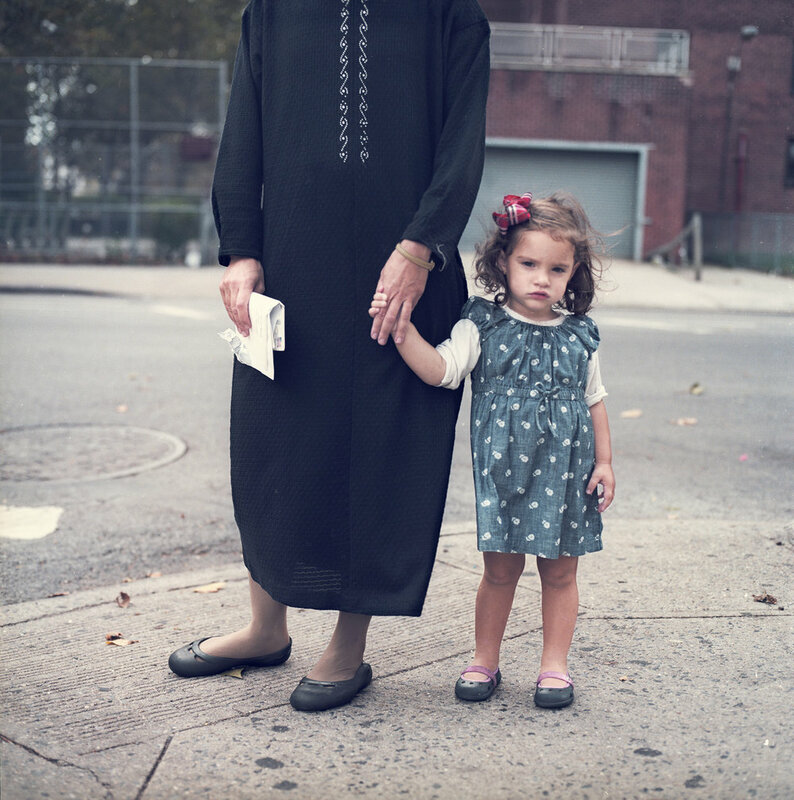 My favorite image I have taken is a portrait of a hasidic Jewish woman on the corner of the street in Brooklyn with her young daughter holding her hand. The reason why this is my favorite is because it was a situation where I was almost positive the mother would tell me that I couldn’t take her photo, but for some reason, she let me. I was totally prepared for rejection, and instead I wound up capturing this really tender and vulnerable moment that, to me, felt like a gift. In your personal work, it’s clear that you like to work in series. How does working in a series format change the way you shoot compared to a commissioned shoot. What do you think are the pros and cons of each format (ex. One day of shooting vs. one month)? I think when you shoot a series over a couple of months or even a couple of years, you get to see a much fuller picture of the overall narrative arch. There’s also a greater possibility of becoming closer were the subject(s) and therefore delving deeper into the personality of your subject. However, having that much freedom can also be detrimental in that if you don’t have a deadline, so there’s a risk that the story may never be completed. With commissions, however, there are often strict guidelines and it pushes me to get what I need as quickly as possible. Sometimes rules are good in that respect. It’s more efficient in a way, but possibly at the sake of cutting a bit too much fat out of the process. What is one piece of photography advice you would give yourself 5 years ago? How much of your work is shot on film versus digital? How does each medium compare for you? I used to shoot much more film, but it’s just gotten so expensive and inconvenient that I don’t shoot it nearly as much as I used to. These days, I usually only shoot film for personal projects or portraits where I know I won’t be burning through a ton of rolls. How do you hope to see your work evolve over the next 5 years? Any upcoming projects that you can tell us about? I’m not sure. I just hope it keeps evolving naturally. We should do this interview again in 5 years and see where we both have ended up. In terms of projects, I have a potential video idea floating around that I’d like to pursue. I also did a series of the mariachi musicians in the Boyle Heights area of Los Angeles. I’m still trying to figure out where that will live.